Our Cedar cabins offer privacy and a romantic hideaway for a couple with breakfast daily. As we only have 2 cabins on our acre, we can assure you of peace and privacy as you sit and relax on the veranda and watch the sun go down. Each cabin has all the comforts you would expect including queen size bed, TV,DVD player, electric frypan, Fridge, microwave oven,hot plates, tea making facilities, heating, air conditioning. Full ensuite. All linen is supplied with pool towels given on request, as well as full continental breakfast in your cabin. Our Gazebo contains a large gas bbq with facilities to cook that special meal. Enjoy the ambience of our hideaway and only a short distance to our great surf beach and restaurants and golf courses. Each cabin has all the comforts you would expect including queen size bed, TV,DVD player, Fridge, microwave oven, tea making facilities, heating.air conditioning. Full ensuite. All linen is supplied as well as full continental breakfast. Winter months and midweek only. Stay 3 nights for the price of 2 . Total stay $200. Breakfast included. 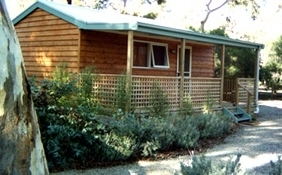 Winter special pay for 2 nights and stay 3. 200pm or earlier by arrangement with owners. Car parking is on the premises within a fenced and gated property. Enjoy a game of tennis on our synthetic grass court or swim in our rock pool. 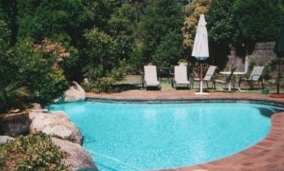 We have an abundant bird life for those nature lovers and share in our natural bush surrounds. Ocean Grove nature reserve is a 2 minute walk where there are many native creatures to watch and observe. Our beaches are world class as well as our golf courses, all within an easy drive.